The excitement of Spring Racing Carnival is upon us and Lady Jayne's latest looks are the perfect addition to ensure you are the first out of the style gates at Spring Racing! New Volume Styl'r and the Vibrant Monochrome Collection from Lady Jayne have hit the shelves just in time for the racing season and Derby Day. Lady Jayne's expert stylist Max May comments, "Spring racing is time to have fun and embrace current trends. One of my favourite looks at the moment is the monochrmoe trend as the look is so clean and simple and accents race wear perfectly - pull hair into a simple ponytail and tie with Lady Jayne's black Pony Snap Cuff or Pony Semi Cuff for a modern chic look." Make a statment with Lady Jayne's Volume Styl'r and turn heads trackside with hair so chic it will have you winning in the style stakes. 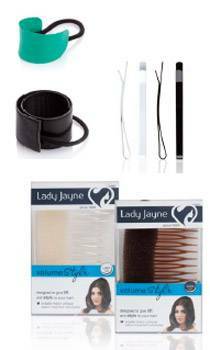 Designed to give hair instant life and style, Lady Jayne's new Volume Styl'r gives you the versatility to create an elegant chignon, the perfect quiff, or the apperance of fuller, healthier looking hair in minutes. Max May says about Volume Styl'r, "i love to use the Volume Styl'r towards the back of the head for a showstopping up-do with instant life. It is such a versatile product that gives the instant effect of fuller, healthier looking hair that is elegant and polished." Style Tip: Complete your gorgeous up-do with a set of natural looking lashes such as Glam by Manicare's new Miranda or Bambi styles for the ultimate flutter. For a full tutorial on how to achieve race day ready hair check out Lady Jayne's series of How To Videos with Max May: www.youtube.com/user/LadyJayneHair. Lady Jayne Cuffs are also really helpful for dance concerts & sport to keep hair in place. Available nationally from pharmacies and Priceline.